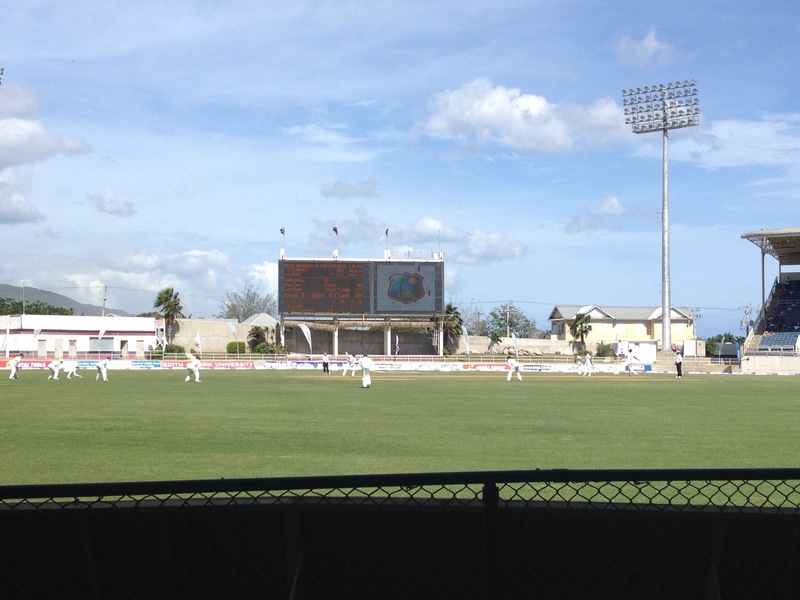 Cricket, 2nd Test, West Indies v Australia, Sabina Park, Kingston, Jamaica, 11-15 June 2015. 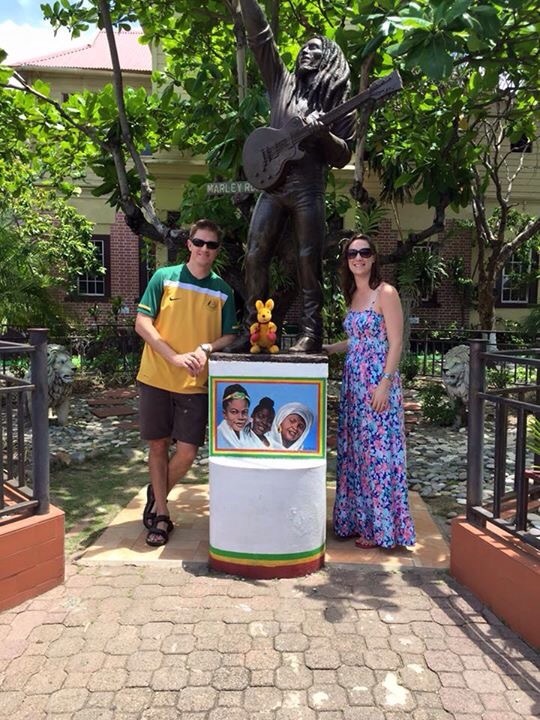 On the morning of Day 3 of the second test between Australia and the West Indies, we missed an hour of the first session so we could visit (and take a tour of) the Bob Marley Museum in Kingston. The tour was interesting – you learned a lot about what influenced Bob Marley’s music (it’s more than just the herb) and the tour guide actually encouraged the tour group to sing some of his songs, including ‘one love’ and ‘three little birds’ – which features this classic lyric. From the perspective of an Australian cricket fan, this couldn’t be more correct. 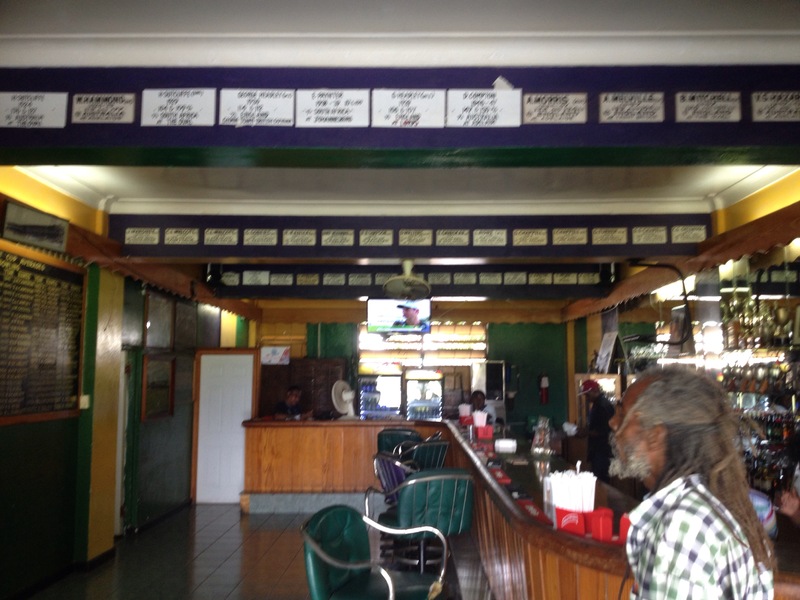 Our trip to Jamaica was a big tick on our ‘bucket list’ – something we’d always wanted to do. The identical t-shirts worn by a number of Australian tour groups at the ground showed us that many other Aussies shared this idea. But early on Day 1, after Warner fell 3rd ball and Marsh soon after, I thought we had travelled around the world to watch our team lose. Then, Clarke spooned a catch back to the bowler Roach and I thought a disaster was on the cards. But I shouldn’t have worried. Everything was going to be alright. Roach had bowled a no ball. Clarke went on to add another 44 runs. Steve Smith added another hundred to his ever growing list, and Australia went from 3-22 (just before the decision was overturned) to 4-259 by the end of day 1. If you were a Windies fan, you had to wonder when anything could possibly go right? Their best bowler, Taylor, had taken 2-0 off 5 overs but was then unexplainably rested until the last over before lunch. The reviews by the Windies failed. On day 2 there was a good shout for LBW but there were no reviews left. And to add to the misery, they dropped multiple catches. In contrast, when the Aussies were in the field, they held nearly all their catches. The mood in the stands was interesting. I’m 36 years old, and there were very few locals around my age at the match. More cynical folks might just say there were very few locals at the match. We spent most of the game in the George Headley Stand (constructed using seats ripped from the Atlanta 1996 Olympic Stadium). Vendors roamed the stands shouting offers of juice, water and (of course) Red Stripe beer. It was a much older crowd, and clearly frustrated by the performance. Heated arguments erupted amongst some locals as they tried to dissect the issues. As the Windies struggled to pass 100 in the second innings, these guys would yell out “WATCH THE BALL!” and “KEEP YOUR HEAD DOWN!”. But, despite their clear frustration with the cricket, they were always lovely and welcoming. On Day 2, we were invited to sit in the Kingston Cricket Club Pavilion. The accents of the KCC spectators were much more English than Jamaican, and the obvious wealth difference showed when a discussion was held about where they would travel to watch cricket this year – not a discussion about about travelling to another island, but to England, for the Ashes, or Australia for the West Indies tour in December. 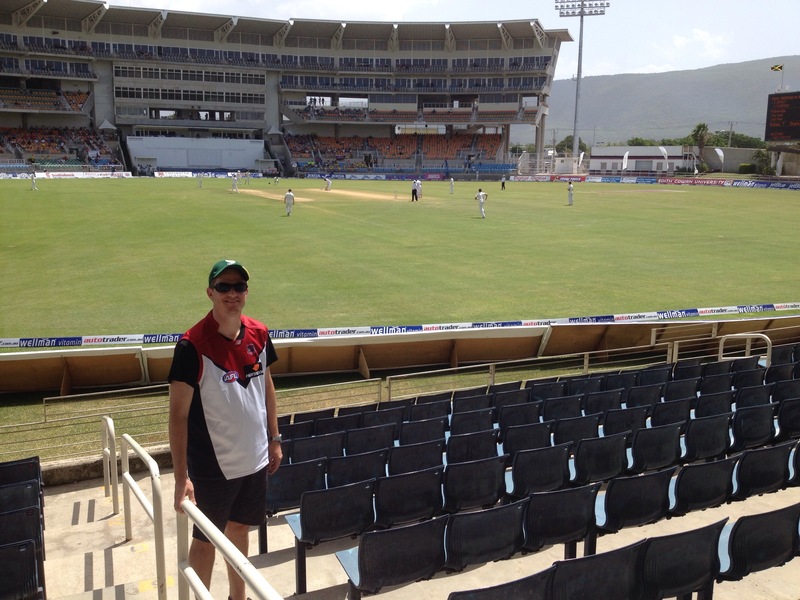 We enjoyed the ground level first-row seats, the historic paintings and memorabilia in the pavilion, and chatting with other fans about West Indian cricket. They listed names of a formidable West Indian XI of players not out there on Sabina Park. Gayle (obviously), Chanderpaul (controversially omitted), Darren Sammy, Dwayne Bravo, Kieron Pollard, and Sunil Narine were the key members, along with the injured Samuels and Bishoo who had played in the first test. We certainly didn’t expect Clarke’s aggressive declaration on day 3, setting the Windies 392 to win, but when Starc had two wickets in the first over to reduce them to 2/1, one of our traveling companions commented on how sad this was to see for the once mighty West Indies, even though we were enjoying the Aussie performance. When I first started following cricket, West Indies v Australia was a five test series and the ultimate challenge. Now, it’s two tests and far from a regular event. I fear not many Aussies will get the chance to make this trip in future, unless it’s to see some T20s. As we left the ground each day, we were handed brochures with Chris Gayle’s smiling face, promoting the Jamaica Tallawahs games in the upcoming CPL series. This is the future of West Indies cricket.